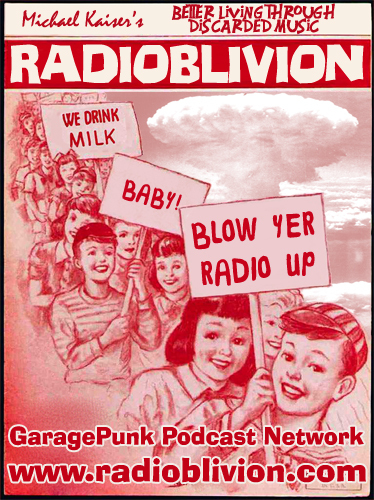 RadiOblivion: RadiOblivion No.56 - Surf, Turf & Instro-MENTAL Madness! RadiOblivion No.56 - Surf, Turf & Instro-MENTAL Madness! Summer is done, friends, and we're sending it off with one last hurrah on this eppy-sode o' RadiOblivion! Nothing but wild reverb overload. All Surf, Hot-Rod and savage instrumental POUNDERS. Get wetter than you've ever been - at least much more than yer "low-flow" shower head can do for ye - with the Fantastic 3, the Thunderchiefs, Jackie & the Cedrics, the Apemen, the Mummies, the Incredible Not Of This Earth & His Famous Booboos, the Treblemakers, Cee Bee Beaumont, and an hours worth of more killers.